If you're interested in technical diving, but haven't yet met the prerequisites for the PADI Tec 45 Diver course or PADI Tec 50 Diver course, you can consider enrolling in the PADI Tec 40 course. It is the first subdivision of the full PADI Tec Deep Diver course and consists of the first four dives. Because you can do one of these dives in confined water (such as a swimming pool), many divers start the Tec 40 courses in the winter months, ready to continue in open water when spring arrives. 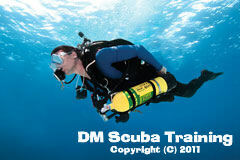 Since its part of the course, your PADI Tec 40 course training credits toward the PADI Tec 45 and Tec 50 courses. The pack includes a manual, dive planning checklist and dive planning slate. The optional Equipment Set-up and Key Skills video on DVD is a great tool to help you practice at home in between your Tec diving adventures. 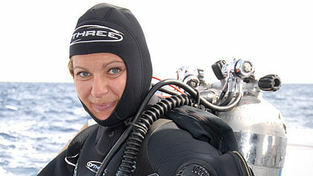 You'll continue to use the Tec Deep Diver Crew-Pak through Tec 45 and Tec 50. Having completed the entry level Tec 40 course move onwards and upwards solidifying your skills further with the PADI Tec 45 course! Normally held at an inland dive site around Bristol. One pool session followed by one day completing three dives in open water.